It’s a slippery slope, my friends. The suggestion by Ogre’s best friend, Dusty, was to go to Pei Wei…his treat, he received a $50 gift card for Christmas. Ogre’s argument, Mina and I went to PF Chang’s. 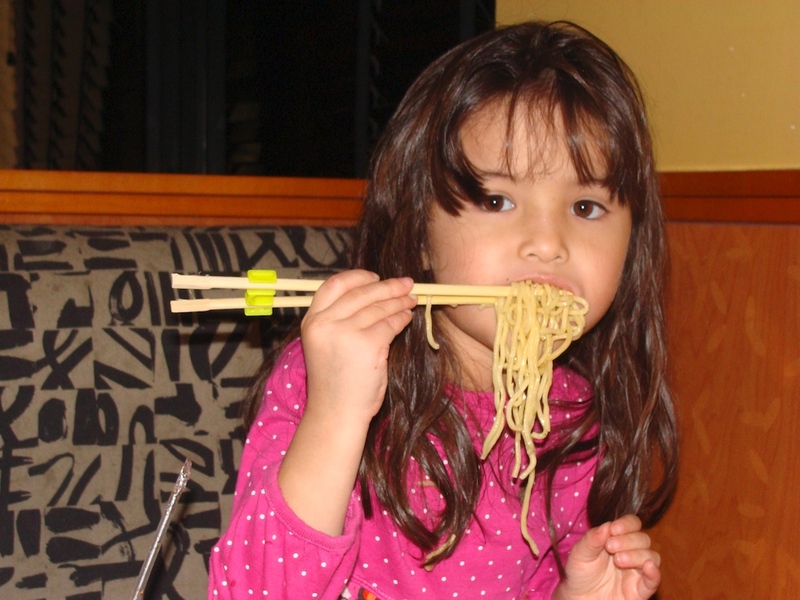 Now, I am not going to deny my sweet little girl a restaurant because it’s chain-y. I tried to deny this one, but by the time, I raised an eyebrow, Mina had heard the “good news” and was up in Ogre’s face excited about going to Pei Wei. Ogre tried to backpedal, but it was too late. What could I do, but load ‘em up and head to Pei Wei with the rest of the crew. It’s counter service, folks, so we went up and ordered our dinner. Don’t get me wrong, we come here often and I like the food. 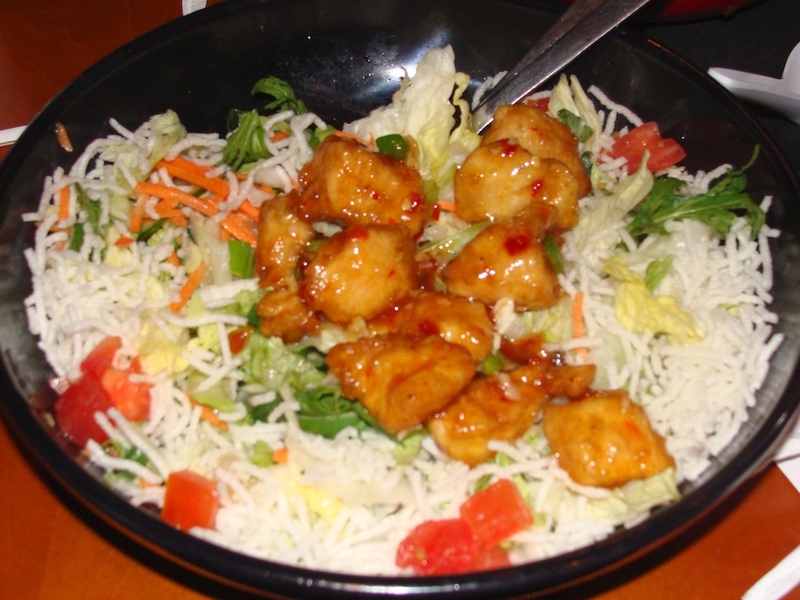 In fact, I like it more than I like PF Chang’s for many reasons. So, we can march right up, put in our order and settle into our booth in no time. Ogre, though, because of his DIET, ordered something different…a salad. Boring. 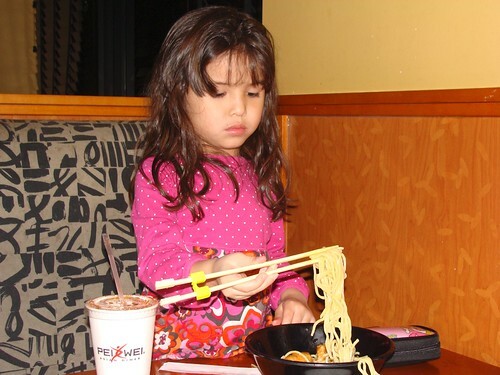 The counter guy think ahead enough to put the little chopstick trainers in the kids Styrofoam cups. I got our drinks while Ogre got the kids into the booth. Now we just had to wait for them to bring out the food. They bring it out as it’s ready. I talked Ogre into sharing the Hot and Sour soup. 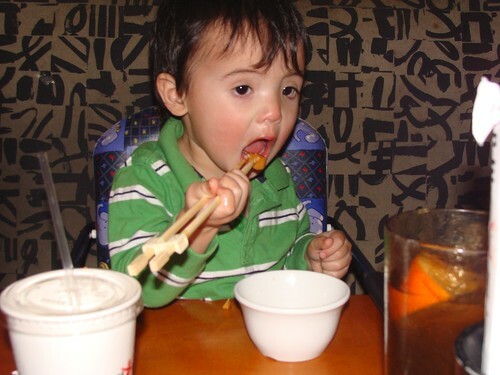 Benji loves soft tofu and was expertly picking them out with his chopsticks. I was beaming with pride. Next out, I think it was Ogre’s salad and Mina’s Honey Chicken and Noodles. I divi’d that up between her and Benjamin and cut up some chicken for Benji as well. Mina also expertly handles her chopsticks. 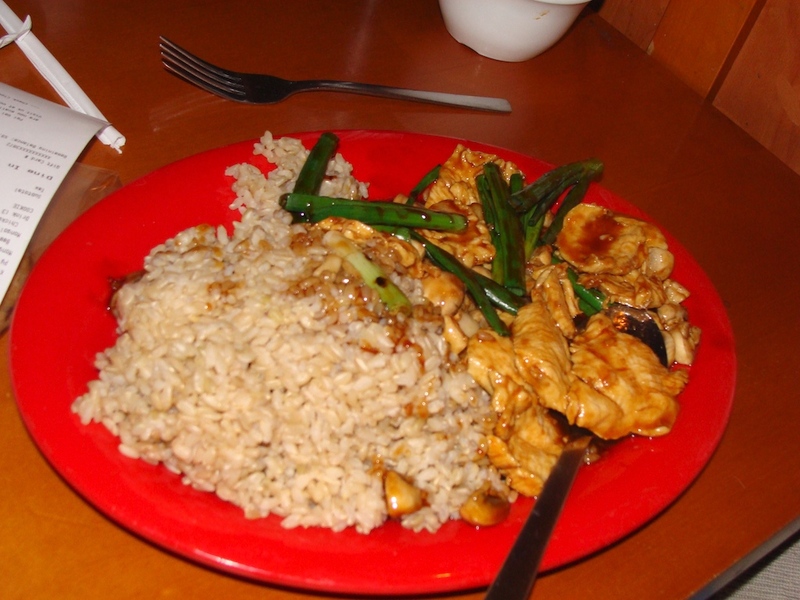 Last, but not least, are my and Dusty’s Mongolian meals -he ordered chicken, I ordered beef. Mina immediately requested that she have some of my “meat.” Sure thing. When the guy brought out the last dishes, he offered to refill Ogre and Dusty’s drinks, which was a nice touch since this place is counter service. We all ate our dinners. The kids love Chinese, so there was no need for prodding today. Benji got a little angry at the chopsticks. His own fault. He’d pull the chopstick out of the trainer and get frustrated that he couldn’t put it back. 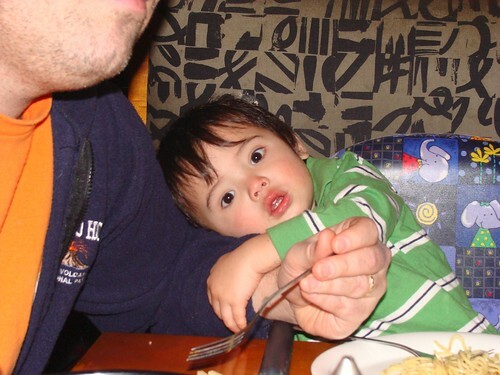 He refused help and instead chunked it across the table. Over and over again. Awesome. I let Ogre deal with that since I was sitting further away! Dusty finished his dinner and started in on the cookie he picked up at the last minute. Those by the register sales tactics really getcha! He promised Mina a piece. Mina informed us that she had chocolate in her pocket. We told her to take the chocolate out of her pocket (to avoid the melting factor). She just giggled and pulled out FOUR ladybug chocolates. Mina ate really well today! When she finished her dinner, she decided she didn’t want any of the chocolate cookie and even gave a piece of chocolate to Dusty and one to Benjamin, who had a piece of the cookie in his other hand. Without blinking an eye, he shoved that whole piece of chocolate in his mouth. And without stopping for a breath, in went the cookie. Sigh. So, it’s somewhat of an Asian Fusion/Faster Food kind of restaurant. Some of the typical Chinese-American dishes and then also some Thai and Korean style dishes. 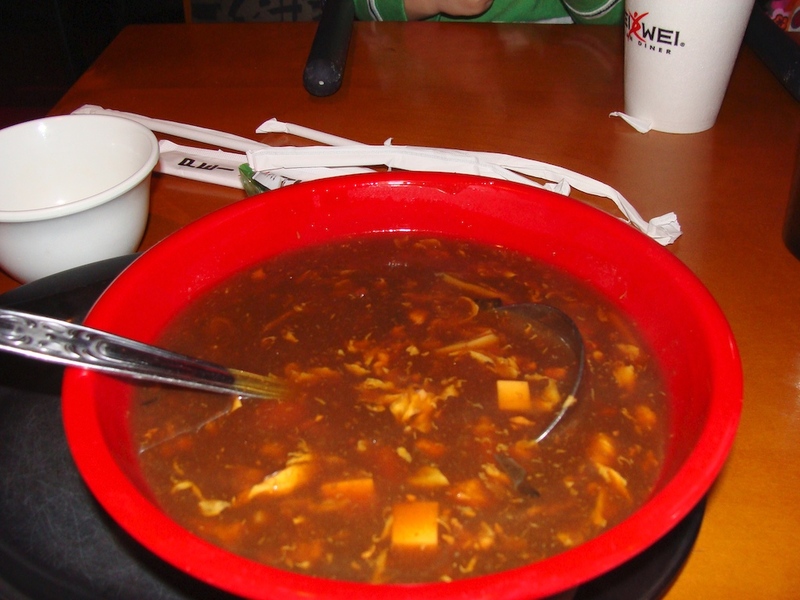 I love the Hot and Sour soup here. It’s not too spicy, so if that’s a requisite for you, you may not like it. It does have a good hearty flavor and definitely has a sourness to it. I think it’s one of the better hot and sour soups out there. I ordered the Mongolian Beef. I think this dish is great, also. 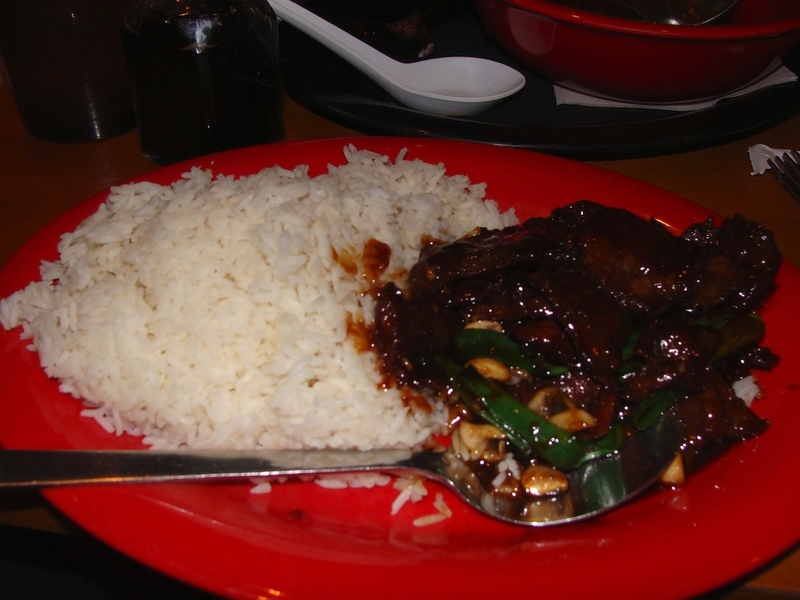 The beef is usually tender and covered in a sweet and soy sticky sauce. Here, unlike at PF Chang’s, it comes with button mushrooms. Unfortunately, tonight they skimped on the mushrooms, but otherwise, it’s as good as it ever is and 5 bucks cheaper than PF Chang’s. Ogre ordered the Spicy Chicken Salad. He said it tasted good. He says it’s semi-spicy with a warm sauce. He was impressed that even with the warm sauce, the salad stayed crisp. 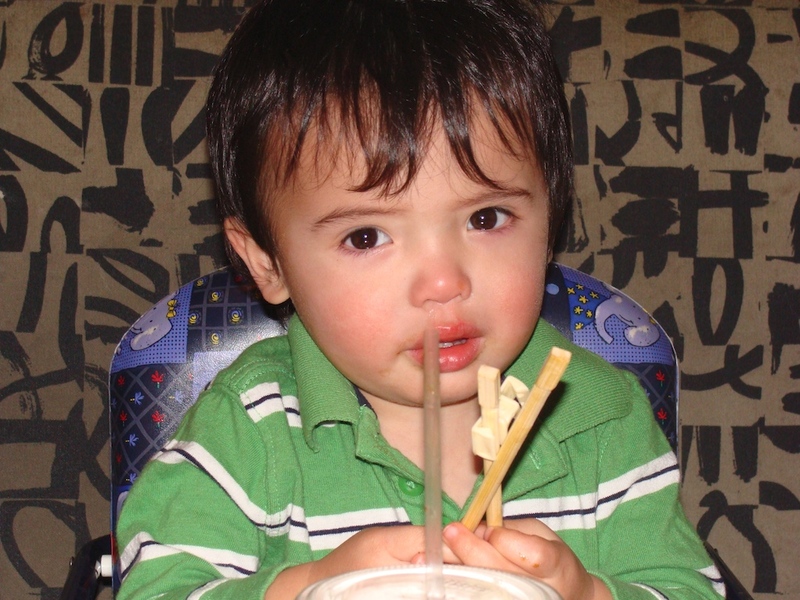 He also mentioned that the Styrofoam noodles are not a nice touch and he hopes to order without out those next time. I’ve never understood those noodles. Does anyone REALLY like those??! 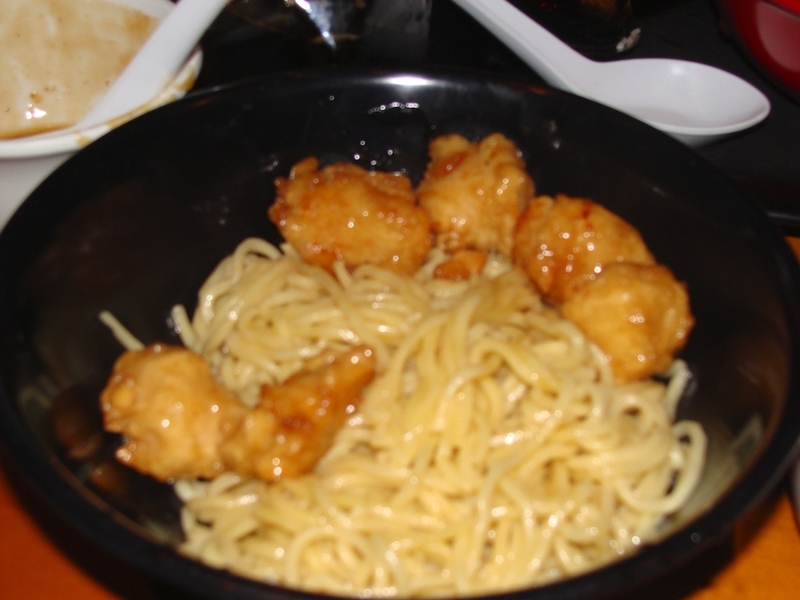 Mina ordered the Honey Chicken with Noodles. I’ve had these and they are quite tasty!! The noodles remind me of a thicker ramen noodle and the chicken is breaded and sweet, but really, not too sweet. Dusty ordered the Mongolian Chicken. Think mine but with chicken instead of beef! I’ll call it counter service plus! Overall, good service when we interacted with the servers! And they cleared our tables when they saw we were finishing up! 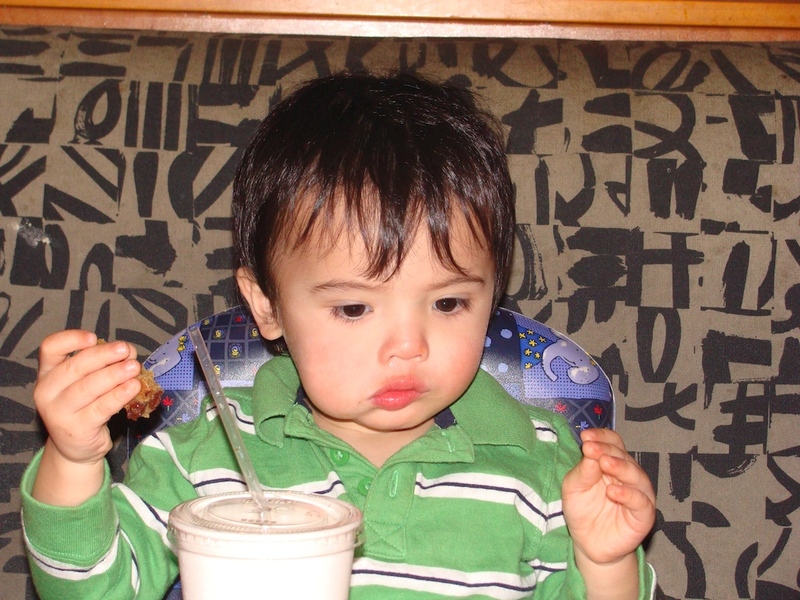 Well, it’s a casual restaurant with kids menu items, so yeah, I’d say it’s kid friendly. There aren’t any kids activities, but the wait is not long at all for the arrival of food and I wouldn’t anticipate crayons and such for this style of restaurant. It’s great for a quick Chinese/Korean/Thai-American bite with the kids. It’s cheaper and less of a hassle than going to PF Chang’s and I think the quality of the food is just as good, if not better! Mina: An exciting opportunity lies ahead of you. Benji: An unexpected relationship will become permanent. Ogre: There is never any harm in asking an honest question. Grace: Many pleasurable and memorable adventures are in store for you! Steve Prohm: Seriously challenging. If we’ve a few teams that have certainly excellent seasons then I feel we’ve the chance to have two NCAA match teams. Coach (Rick) Byrd is really a flourishing, experienced coach. of items that are assets to be listed for your business. conversions and updates and more. What school district the property is in can make a huge difference. The driver’s licensing exams in all stated require that drivers pass a vision test, but they do nothing to test for reaction speed. make your beach holidays easier, safer, and more meaningful. I just feel the Light is too light. which helps transform a cluttered office to something more convenient and space productive. system to track down ‘caches’, or packages of trinkets hidden somewhere in the real world. productive results than the old technology. ” How uncomplicated those words roll off our tongues. It allows you to wear spring’s hottest color trend to remain fashionably current but will also maintain your professional appearance at work. There is a certain type of fashion blogs content writing for which is done especially by prominent designers or their assigned group of website content writing professionals. It truly is truly a very helpful bit of info. I’m just pleased which you contributed this beneficial facts here food delivery. Be sure to remain united states current similar to this. Appreciate your discussing.